Yes, yes, yes... back to Pinnacle... but this will probably be the last one of these for a while. I ended up getting a total of four of these blasters from Dave and Adam's Card World, and this is the last one. I hope it ends up being a good one! So if you've read my last few Pinnacle reviews, you know that I've been having some pretty positive breaks of the stuff - nothing mind blowing - but very decent, especially for the price. It's awesome that you get to look forward to some sort of hit in the blaster. I've only ever gotten jersey cards, but I still hold out for the hope of getting an autograph or patch card. It could happen! Hits and inserts have come in every other pack so far when breaking blasters. That would be one interesting thing to look out for as I open this blaster. Will that trend continue? We'll definitely find out real soon. Also, I've really been waiting for one of the big name rookies to come out of this product. 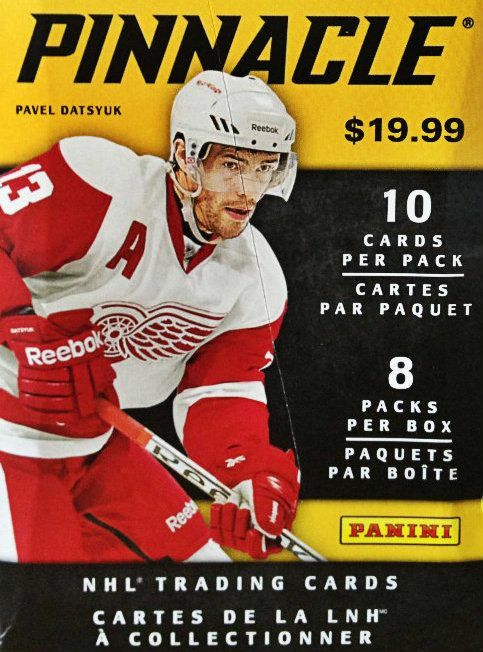 I haven't seen Hall, Eberle, Subban, Seguin, or Skinner yet in my Pinnacle breaks as of yet. Let's open up this bad boy and see if any of those guys will come out! This box turned out to be a pretty nice box, just as good if not better than the other ones I had busted in previous Retail Reviews. The box contained the usual big stack of base cards and two Ice Breaker rookies, a Nufex parallel, and a Tough Times insert along with a jersey hit. One of the two rookies pulled turned out to be a real winner while the other one, Jonas Holos, wasn't so much. 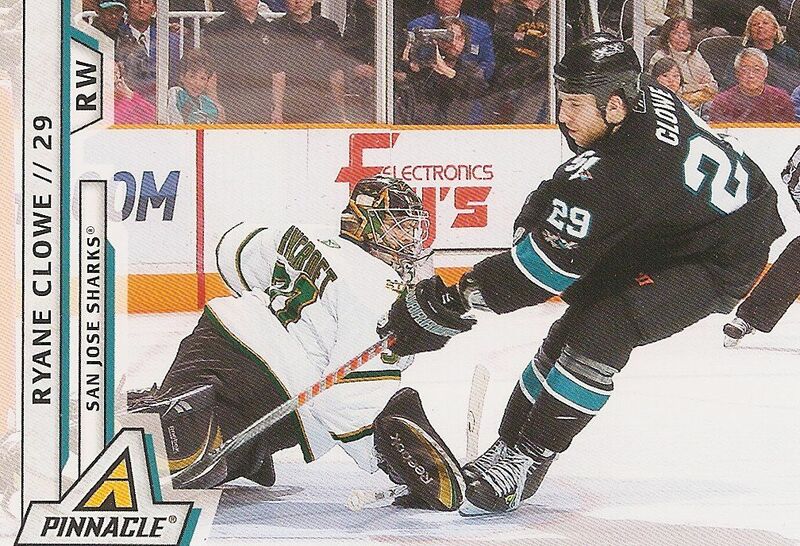 The Nufex parallel card of Tim Gleason was a little disappointing. Gleason is not a player I am very familiar with, and the photo used on the card didn't lend itself well to the Nufex foiling process. You could see in the video that I was struggling to find a good angle to show you on camera. My Tough Times pull was John Wensink of the Boston Bruins. Not a huge card, but I'll mention again that I do enjoy the Tough Times inserts quite a bit. This card makes me a little sad. This week Ryane Clowe was traded to the New York Rangers. Clowe was a great person to have on the Sharks. He was a HUGE fan favorite - definitely one of mine! He had been a Shark for his entire career. He struggled a bit this season and so off he went to New York. He made an immediate impact by scoring 2 goals. I'm pretty sure the change of scenery was needed by him, but it still blows that he isn't a Shark any longer!!! Finally! I'm glad I got a top rookie in one of these blasters! Seguin is a great young talent and has already won a Stanley Cup. There was a debate back when Hall and Seguin were about to be drafted regarding which one should be the first pick that year. 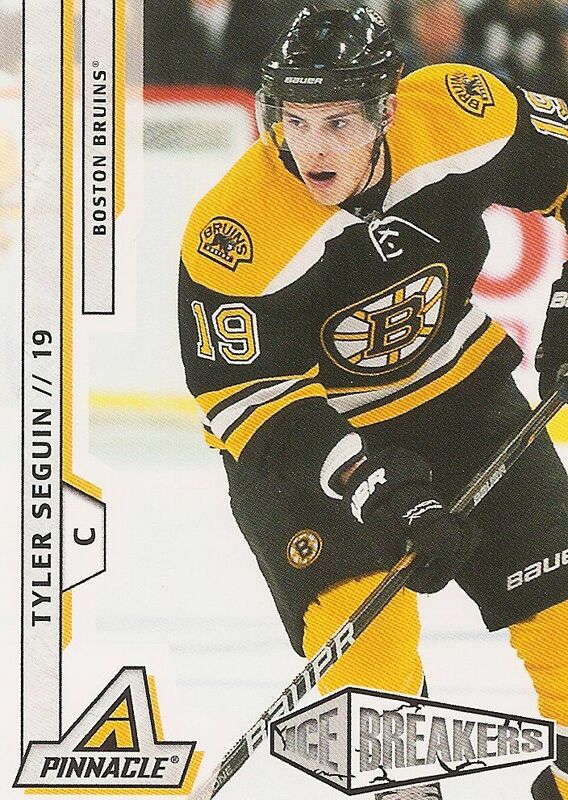 While it turned out to be Hall, Seguin was no slouch of a pick! It'll be interesting to compare their two careers when all is said and done. 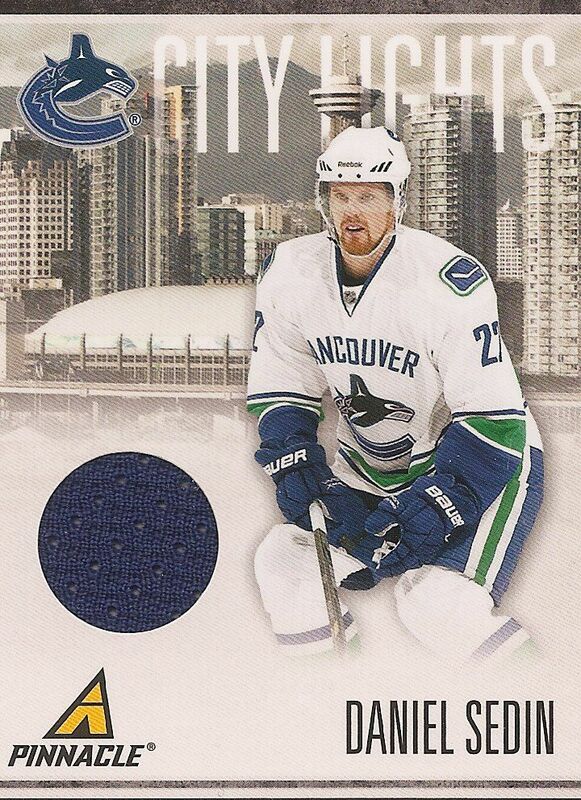 Though I'm absolutely not a Canucks fan, this card deserves top honors this week. Daniel and his brother are the engine of the Vancouver team. Both have been all-stars and are highly skilled players. It's nice to get a jersey card of someone of this caliber. As you can see, Pinnacle is a very sweet break for the price. At this point it's practically buy one get two free!!! You've seen me open up quite a bit of it. Hopefully it has inspired you to open up some for yourself. I definitely recommend it as a fun product to break. It's also a perfect product to help get younger collectors into the hobby. Getting a hit is always exciting, even if it's 'just' a jersey. And even for newer adult collectors who have not gotten cards before (or in a long while), these hits are still great pulls to look forward to and find in packs. I have to say that overall, Pinnacle is a definite winner. Let me know what you thought of my 10/11 Pinnacle blaster down in the comments below. What have you gotten out of these blasters? I'd love to know! I still really like these cards. The photography is interesting it reminds me of UD Canvas. I like how the writing is on the side of the card and not along the bottom. The city light cards have a really nice background on them. I just wish that there were two colour patches or even three. One is nice but with how nice the background of the card is its a bit of a let down. Overall for the price you cannot go wrong. It is perfect for young collectors or even seasoned vets who want to try and complete a set on the set. Thanks agaain for another review. yea no problem! thank YOU for reading! i appreciate the mini review. pinnacle is pretty cool and fun to look at. i think a lot of people have enjoyed the city lights cards. i have found, however, that they leave me wanting a little in terms of the city photography. i'm not sure if it's too far away for my tastes, but i think i'd like the background to be a little closer. it's a nitpik, but that's just how i feel.